Gemma Frisius (or Reiner Gemma, December 9, 1508 - May 25, 1555) was a mathematician, cartographer and instrument maker. He created important globes, improved the mathematical instruments of his day and applied mathematics in new ways to surveying and navigation. He was born in Dokkum, Friesland (present-day Netherlands) of poor parents, who died when he was young. Though a poor orphan, he studied at Leuven beginning in 1525. 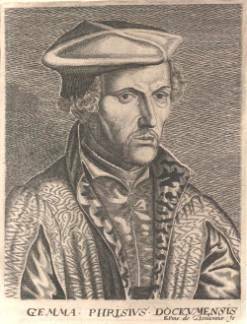 He received the degree of MD in 1536 and remained on the faculty of medicine at Leuven for the rest of his life. While still a student, Frisius set up a workshop to produce globes and mathematical instruments. He became noted for the quality and accuracy of his instruments, which were praised by Tycho Brahe, among others. In 1533, he described for the first time the method of triangulation still used today in surveying. Twenty years later, he was the first to describe how an accurate clock could be used to determine longitude. Frisius created or improved many instruments, including the cross-staff, the astrolabe and the astronomical rings. His students included Gerardus Mercator (who became his collaborator), Johannes Stadius, and John Dee.